Continuing with pulling out things I picked up quite awhile ago, 2016 for this one! I had picked up the SDM Fragrance Sampler box during the same SDM Bonus Redemption weekend that I had picked up the SDM Mascara Sampler, reviewed here. Since that coupon was still good, we will see if the one from this SDM Fragrance Sampler box is as well. Sorry for the not so great picture of the box! I am sorry for the not the greatest pictures of this product! I had thrown out the box a while ago and was lucky enough that I had some pictures of the box from when I had picked it up so long ago! As I had said in the post where I had picked up the SDM Fragrance Sampler, I had been eyeing these Fragrance boxes for quite some time and it was finally in stock when I redeemed. I love mini products, especially perfume bottles when they look like miniatures of full size ones. Inside of the box I got 7 mini perfumes, some had boxes included in the centre of the box some did not. There is also a Fragrance Guide as well the gift certificate. 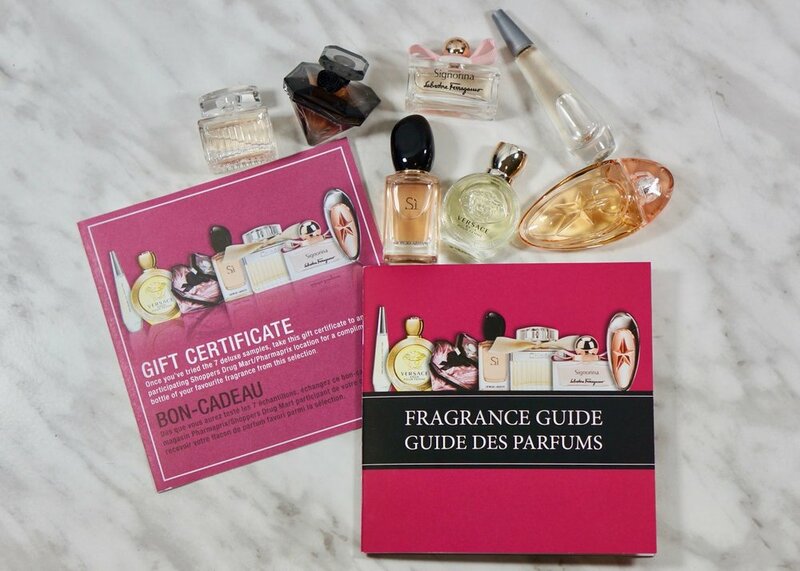 The Gift Certificate allows you to redeem for a full size bottle of one of the mini perfumes included in the box. The Fragrance Guide gives you some hints on choosing a fragrance as well as descriptions of each fragrance. The 7 mini fragrances, Gift Certificate and the Fragrance Guide. I believe that all 7 mini perfume bottles are very similar, if not the same, as the full size counterparts. Aren't they all beautiful?! I knew when I picked up this Fragrance Sampler box, that I do like 2 of the fragrances already. So I know that I will be able to get one that I already like. Which is a good thing considering that the sampler set is $105 CAD to buy now , here is a link to the one available now. I am pretty sure that when I picked it up that is was under $100 though. Each mini fragrance bottle contains between 3.5 ml to 7 ml, depending on the fragrance. The fragrances included in my SDM Fragrance Sampler box are - Issey Miyake-L'Eau D'Issey Pure, Versace-Eros Pour Femme, Lancome-Tresor La Nuit, Giorgio Armani-Si, Chloe-Chloe, Salvatore Ferragamo-Signorina, and Mugler-Angel Muse. 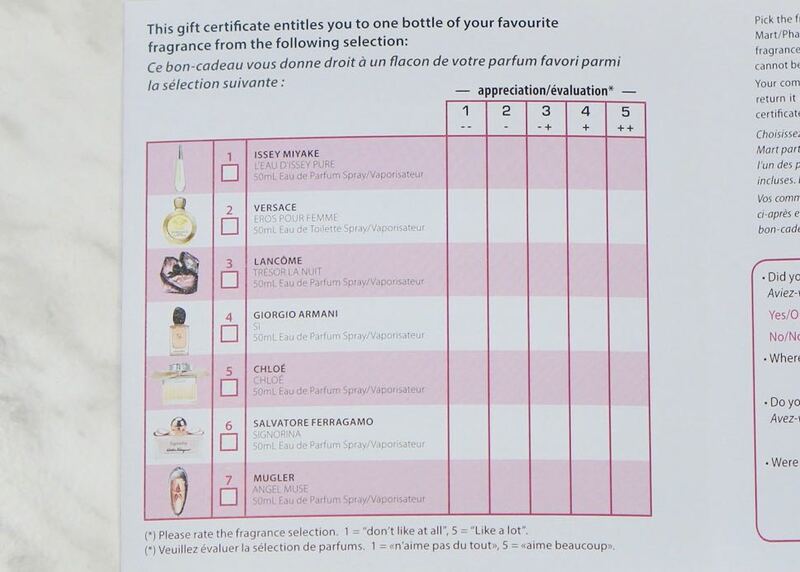 The Gift Certificate gives a list of the fragrances with a 1-5 rating selection. That way you can rate how you liked each of the fragrances as you try them out. So once you have tried each one out and rated each one, you will be able to pick between the ones that you rated the highest. 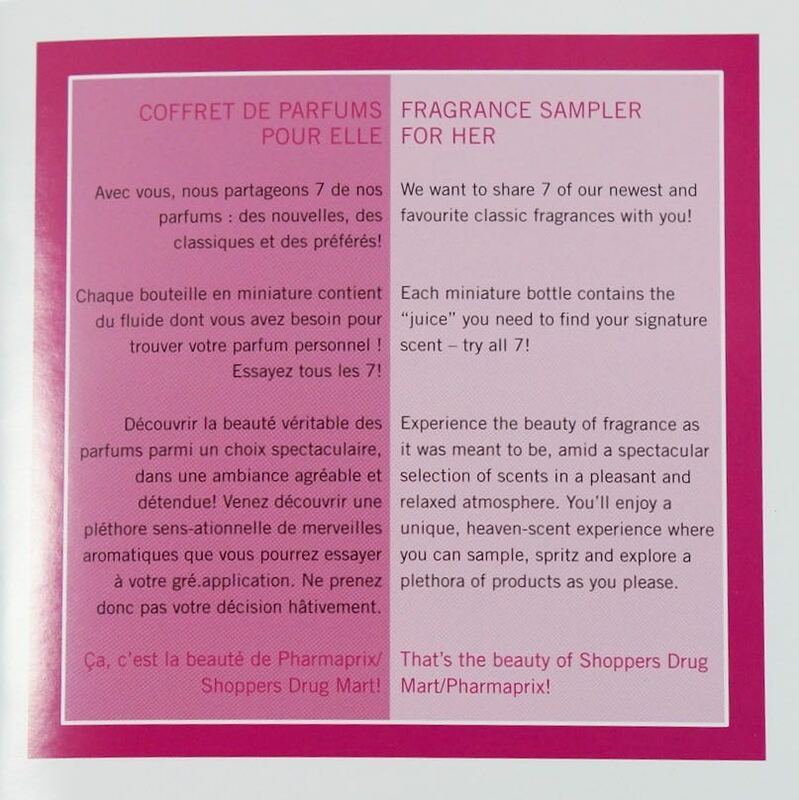 There is also a short survey to complete at the bottom of the second page asking you a few questions about the fragrances in the Sampler.On the back of the Gift Certificate it gives you instructions on how to redeem for your fragrance of choice. The Fragrance Guide included in the Sampler gives you a list of each fragrance, with the corresponding page number for each one. There are some helpful hints about testing a new fragrance, like to test on your skin, sample 1 0r 2 at a time as the scents start to blend together and your nose can't distinguish them, etc. Also that Fragrance on your skin will smell different up to 2 hours after application, I never noticed that before! It also reminds you to check semi-annually as the assortment of fragrances in the Sampler gets updated. I plan on testing each fragrance for a week, and than I will report back on each one as I try them each out. Similar to how I did the SDM Mascara Sampler. I will also share the tones and style of each fragrance as we go along! Who knows, maybe I will find a fragrance that I like that I can even wear to work, in a hospital setting! Have you ever tried a Fragrance Sampler Box? What did you think of it? Worth it? Or not?